Whether you’re setting up an aviary or just want to attract wild birds outside, having a suitable bird feeder is a must. It’s time-consuming to keep refilling bird feed containers and you don’t always give the right amount of feed so it would really be helpful to invest in one. It will also help ensure that your avian pets are getting the necessary health benefits from their food. If you are not too sure which feed to give them, this guide on bird nutrition is very informative. If you have other pets in your home though, you must also make sure that the birds are safe from them. For those who have cats, you need to keep them at a good distance from your aviary. You might also find this list of the best cat toys useful. 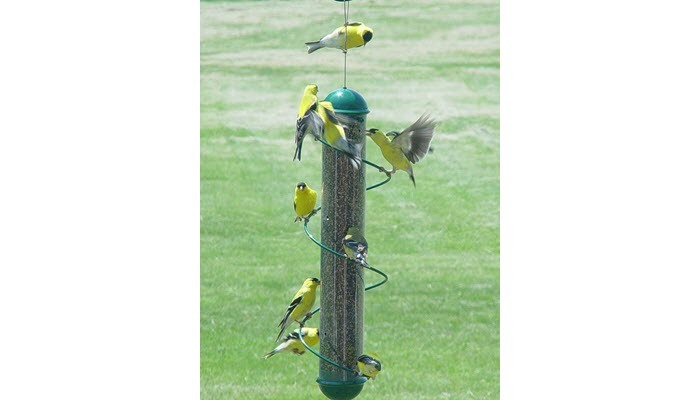 There are various types of bird feeders available. We’ve listed down the best models you can buy online. 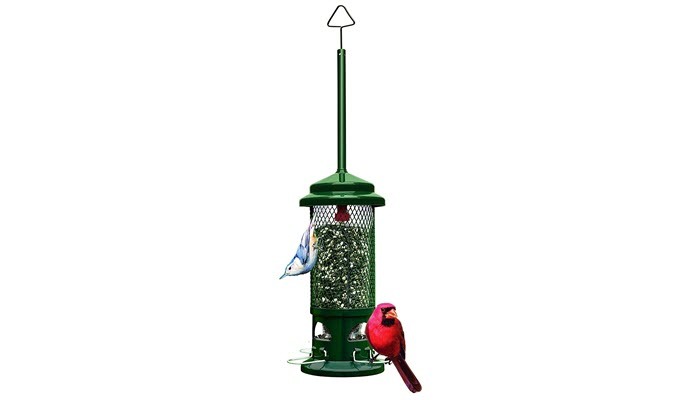 Our top choice is the Perky-Pet 312 Panorama Bird Feeder. It features a tray style feeding port that stays continuously full because of the container design. 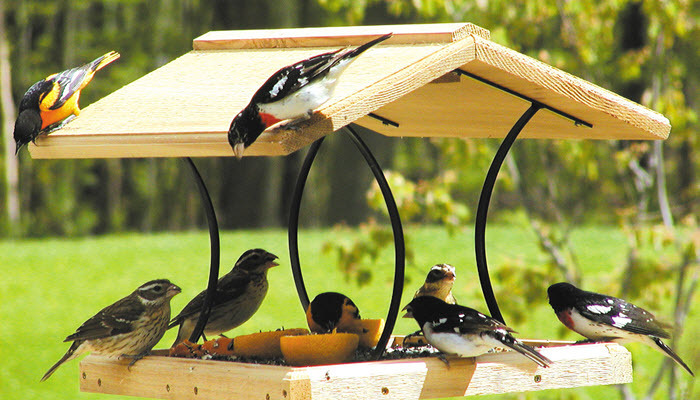 The circular perch allows birds to feed in all angles on the feeder. This bird feeder keeps squirrels out if placed outside, because of the sure-lock cap that locks the lid securely in place. It has a brown powder coat finish to resist rust so this is great outdoors and can withstand weather conditions. The feeder has a 2-pound seed capacity. 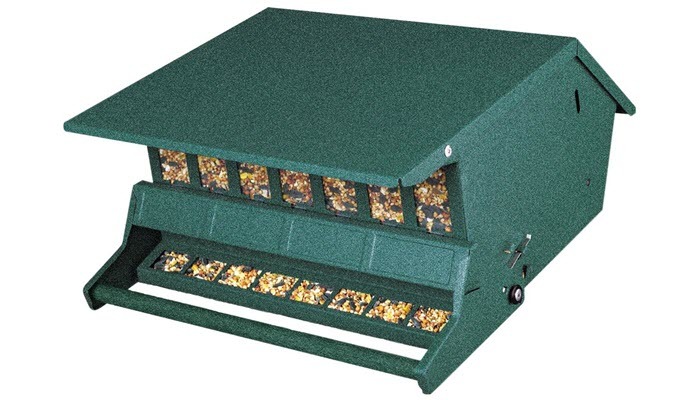 Our next top choice is the Brome 1057 Squirrel Buster Standard Wild Bird Feeder. It features a seed saver technology that blocks squirrels from accessing the seeds when they happen to come around. The weight of the feeder automatically forces down the shroud if they climb onto it. It attracts a wild variety of clinging and perching birds that will surely liven up your backyard. The transparent seed tube design traps solar energy and prevents hot moist air from escaping while letting fresh air enter the seed port. This means that the birdseed will remain fresh for a long time. 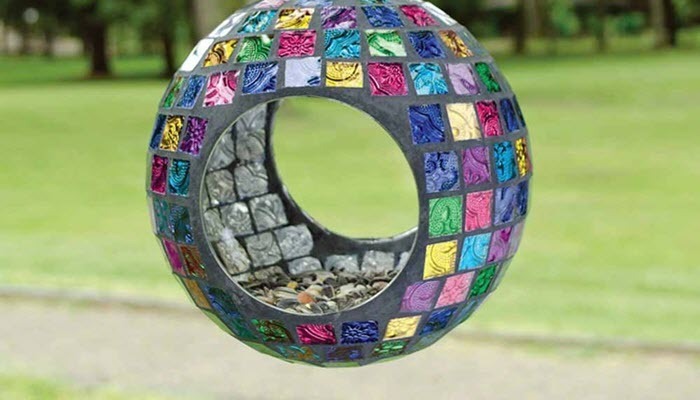 A nice alternative would be the Carson Home Mosaic Glass Circle Bird Feeder. This is made of glass, mortar, and metal, and looks amazingly great in your yard. It is sculpted from high-quality art glass so this also serves as a décor in your home. The feeder has a wide opening, allowing easy access for birds. It hangs easily from any tree or post. This item is a little bit more expensive but has a very classy design. A disadvantage is a glass may crack if it slips down. 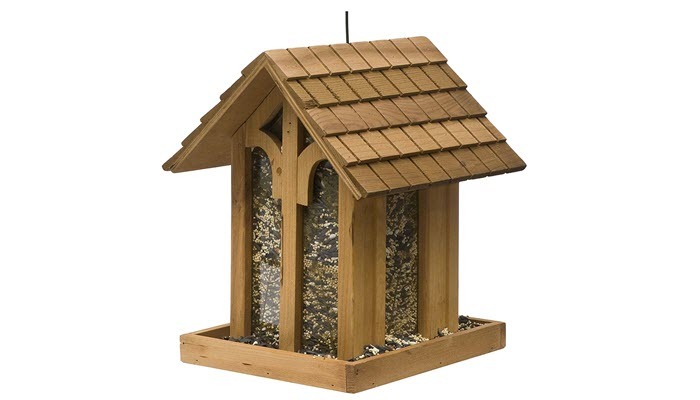 The Perky-Pet Birdscapes 50172 Mountain Chapel Bird Feeder is also a great option. It has a natural wooden design with detailed leaf print windows that would look great on your aviary or backyard. The transparent seed compartment windows allow you to easily see the seed levels and monitor when it’s time to refill. This bird feeder will help you lure different types of birds and you will see them flock to your yard to feed. 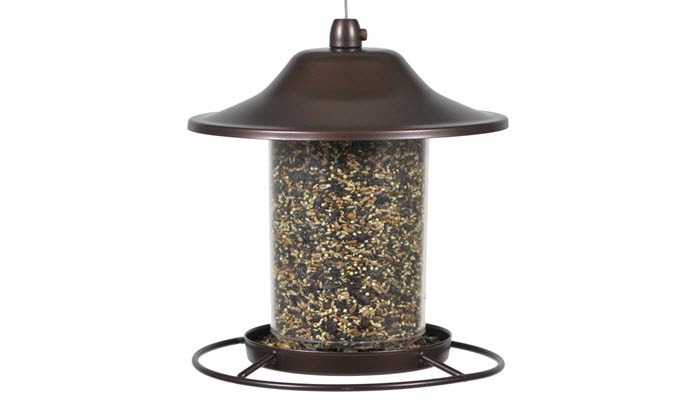 If you want something simpler and more straightforward, the Heritage Farms Audubon Bird’s Delight Squirrel Resistant Bird Feeder is perfect for you. It has a durable powder coated steel body. It’s squirrel proof so that when a squirrel gets on top, the perch closes access to the seeds. It holds up to 9 pounds of bird seeds so there is less need to refill. The feeder is designed with an overhanging roof and hopper which help keep the seeds dry and protect them from outside elements. The Perky-Pet Clear Window Feeder is a really affordable option. This one attaches directly from your window so you can enjoy watching birds feeding on your house for hours. 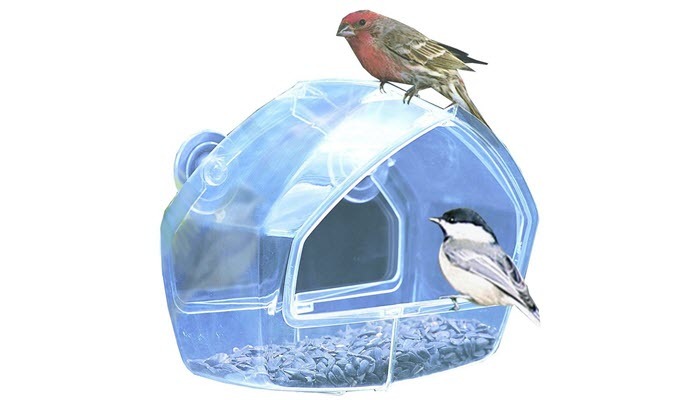 Its transparent design allows you to see the birds even when they’re feeding inside it. It is made of shatterproof plastic so there’s no risk of cracking or breaking. It’s easy to fill and clean. The feeder has a 1 cup capacity for bird seeds. This is perfect for those who like watching birds from inside their houses. 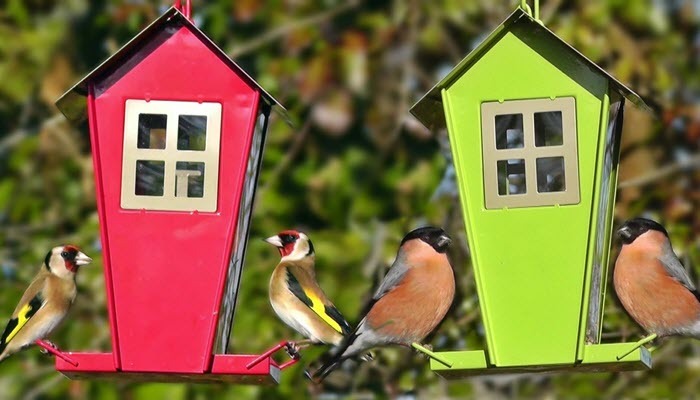 Choosing a bird feeder would depend on where you want to place it, along with other factors. You also need to think about how it will protect and preserve the bird seeds inside. If you are placing the bird feeder outside, you need one that can withstand different weather conditions especially winter. The seeds must be kept dry to keep them fresh so good ventilation is a must. It should also keep moisture out or the seeds could easily get ruined. There’s no need to hate on squirrels but you don’t want them eating the food that’s meant for your birds. When placed in your backyard, choose a bird feeder that can resist squirrels. There are models out there that have special technology which automatically closes the seed access when it detects squirrels climbing on top of them. These type of feeders attract a wide variety of birds. The problem with this is that it offers no protection from the rain and depending on the material, they could easily rust. If you want a tray feeder, choose one that has a screened bottom to drain water and snow out. These are usually made of wood. If you opt for a house feeder, make sure that it is at least protected from rain. You need to clean them regularly and you need to watch out for squirrels too. 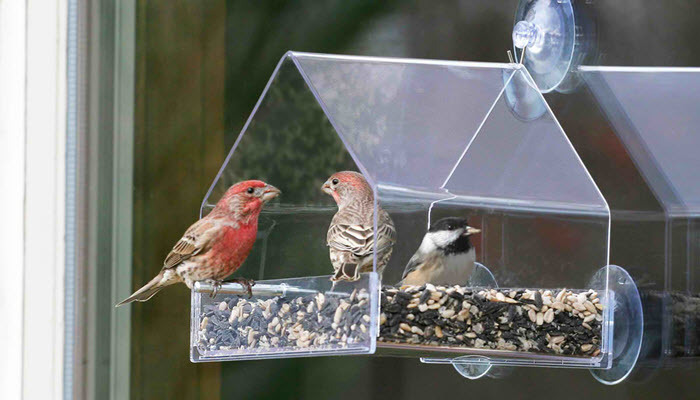 If you want a feeder that can be attached to your windows, check for the suction cup and make sure that they’re strong enough or they could fall. But these provide easy access for birds. This type of feeder has a hollow tube and usually weather resistant. The seeds are not easily accessed by squirrels although they might chew on the metal. 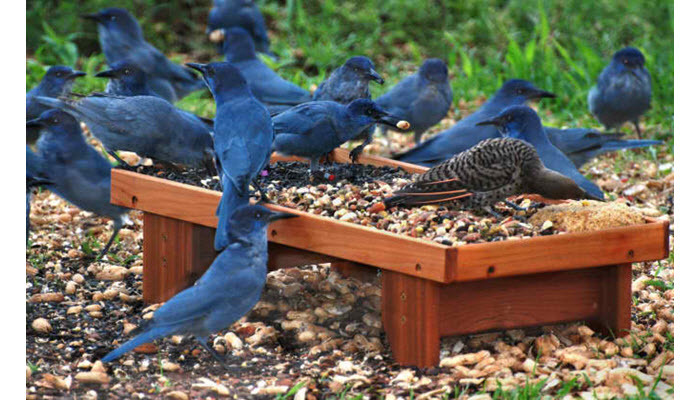 There are other variations of bird feeders out there. The important thing is to keep in mind their resistance to weather and other elements and make sure that they’re easy to clean.